The cast on Joe Haden's finger wasn't enough to allow him to play in last week's loss to the San Diego Chargers. Browns cornerback Joe Haden says he did everything he possibly could to play last Sunday against San Diego, but the pain in his broken finger was too much to overcome. Haden took a painkilling injection and tried wearing a thick cast on his finger, but decided that playing with one hand would hurt the team more than help. “I felt like I owed it to the team and just my wanting to go so bad and wanting to play so bad. My body wouldn’t let me,” Haden said Wednesday via The Chronicle-Telegram. “So when it came down to it, I got the shots, I put the cast on it and went out there to play and it still felt like it did in practice when I couldn’t use (it). I felt like I was playing with one hand. Haden, who was limited in practice Monday, is hoping his finger feels good enough to play this Sunday in Baltimore. He is also dealing with a rib contusion that Haden said is less of an issue than his finger. 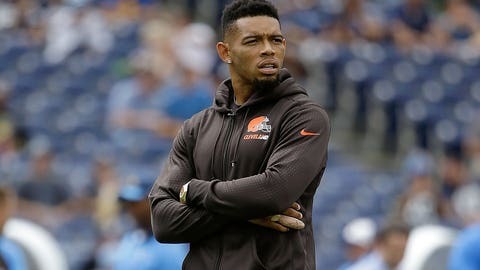 The Browns’ late scratch of Haden caused haywire with their defensive playbook, and also raised eyebrows with the league office since he was listed as probable throughout the week. The matter is currently being investigated, but head coach Mike Pettine doesn’t expect anything to come of it. Pettine also took some heat this week for saying that Haden didn’t want to play with a broken finger. Pettine said he misspoke and was willing to accept blame for the way he disclosed the news about Haden’s absence. He then praised Haden’s status as one of the faces of the franchise and sought to clear the air. “He sent me an extensive text and then we talked, so we’re good,” Haden said. “It was just a lack of communication. That’s all it was, so me and Pett are good moving forward.